Hi, my name is Kate, and I'm addicted to barbeque. 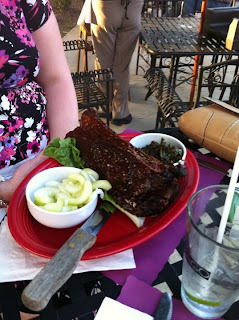 Here's a photo of me enjoying the yabba dabba doo rib, with sides of cucumber salad and collard greens, at Smokin' With Chris in Southington, CT, this summer. My friend snapped this shot with her cell phone because she was amazed at the meaty proportions of my dinner. What can I say? I can eat. First of all, barbeque restaurants are a great choice for someone who eats primal and low carb, because there is a lot of meat on the menu, and oftentimes, there are more veggie-only sides served ala cart than in a typical restaurant, including collard greens, coleslaw, buttered green beans, you name it. So hop on google and check out barbeque restaurants in your area, and how they've been rated. That's how I found Smokin' With Chris, and it ended up being one of my favorite restaurants. You've got to be vigilant, though. Our common enemies, sugar and starch, are lurking about, ready to hop on your plate and climb into your belly. Enemy #1 - SUGAR - is what makes sweet and tangy barbeque sauce so freaking tasty. Don't give it a chance. Order your sauce on the side, as many restaurants will smother it all over the protein portion of your dinner plate without a thought. Also, go for an option that is typically sauce-free, including dry rubbed ribs, brisket, smoked turkey, and steaks (I love me some good, rare rib eye), avoiding pre-sauced things like pulled pork (unless it is Carolina-style que, basted with a lip smacking concoction of vinegar and mustard). Remember this general rule: beware the sauce - especially anything that is tomato based. If you really need to dip, take a cue from Alabama-style white barbeque sauce and ask for blue cheese or ranch dressing - or my favorite - horseradish sauce, on the side. These creamy dressings are full-fat, low carb alternatives that can help whet your whistle in a pinch. Don't be afraid to ask whether a side dish that sounds innocuous (i.e., coleslaw) is "sweet", and ask for a sample if the server isn't sure. Enemy #2 - STARCH - is why the creamed spinach is so, well, creamy. In fact, if you are at a restaurant, and there is "cream of..." anything on the menu, avoid it like the plague. "Creamy" is usually a misnomer, as most creamy foods are not that way because of the addition of cream. Typically, things like creamed spinach, any cheese sauce, New England clam chowder, and any other creamy soup or stew, including gumbo (which you can often find at barbeque joints), are made with a roux. Roux is a cooked mixture of fat and white flour, which thickens hot liquids. Some soups are thickened by the addition of other starches, like cornstarch (think hot and sour soup at Chinese restaurants), while others contain cooked starchy vegetables, which are either partially or entirely pureed with an immersion blender (corn chowder usually has more potatoes in it than corn - not that I eat corn... but you know what I mean). Watch out for any soup that is opaque. Finally, and this is the toughest thing to do when eating barbeque... either don't drink alcohol with your meal, or limit yourself to one low carb option, like a glass of white wine (or even better, a white wine spritzer made with club soda), or a diet G&T (made with diet tonic, y'all). Definitely no beer (even low carb beer)! Nurse your drink, and get water or club soda on the side. I know that this is asking a lot. But, here's the bottom line: drinking alcohol will send your liver into overdrive and it will spend much of its barbeque night efforts detoxifying your blood of the alcohol that you have consumed. While your liver is so occupied, it is not able to turn your stored fat into energy through the process of lipolysis (the breaking up of lipid into its constituent parts happens in the liver). On the off chance that you've imbibed any carbohydrate (weren't you being VIGILANT?? ), its going straight to your @*$!! (Actually, it is probably going directly to your belly). Now that we've talked, I think its safe to dig in!